what the hell? why does bandai keep teasing fans like this with figures that they don't know if they will release? That might explain why Bandai's dipping into the Classic catalog; the Classic series always had a rather large following in Japan; so they can make X series stuff for the worldwide audience and Classic for Japan. ...but it's Bandai, so I'd guess it'll depend on how these new rounds of figures sell. @3rd anon: Not ONCE have these models been given the 'Yeah it's going to happen'. Don't act like Bandai said that, because then you're just delusional. Teasing us with a product, then telling us they may not release it? I've seen this happen not too long ago...and it ended very, very badly. Online feedback is bull. If those polls are any indication, then they're going to do whatever they want to regardless of what the public says. You want the Bass/Treble set to happen? Buy the D-Arts Megaman/Rush set. If that sells well, they'll make it happen. Money speaks louder than internet rantings. THEY HAVE TO RELEASE THIS. IT'S PERFECT. He will become a product. No doubt about it. No reason to get worked up. If he doesn't get mass produced, I'll be VERY surprised. I would too Megamac. We all know Mega Man and Rush will sell really well. Its a given. Some robot master statues with recolored Mega Man and weapon would be cool too. Hell some mavericks with recolored X and weapon would be awesome! 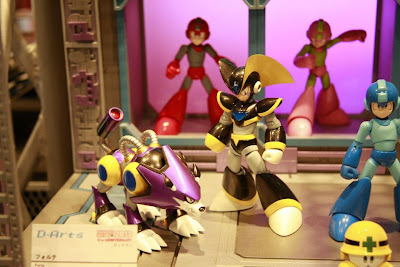 come on bandai, release the bass figure :( there hasn't been a good bass figure made since the late 90s when bandai released the rockman 8 bass model kit and that was over 15 years ago, it's about time bass got a new figure released.